I added some monthly tracking to my quilting routine this year. Inspired by Kate at Life in Pieces, the first is to track how many days I spend at least 15 minutes sewing. I have no illusions at achieving 100% (that shop already sailed!) 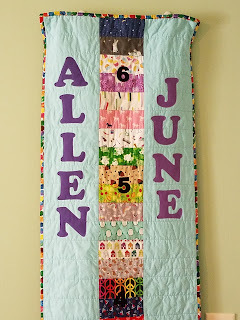 but am more curious about how many days in a year I really do get time to sew. 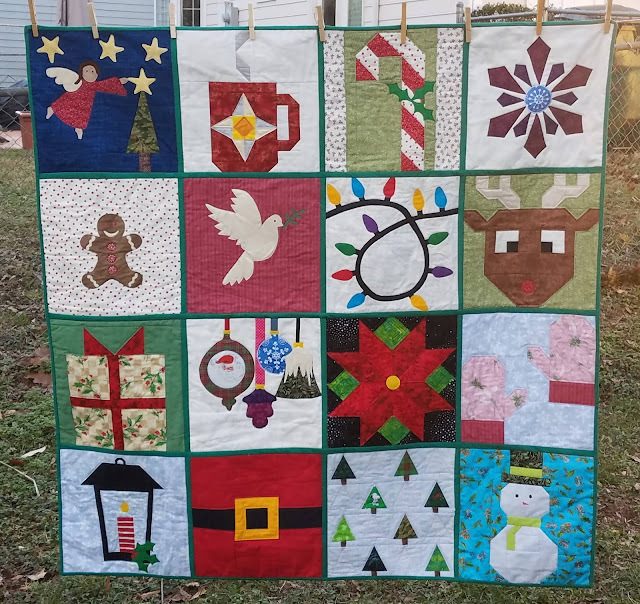 In January, I got sewing time 24 out of 31 days, or 77% of the month. I'm also tracking yardage used. I've seen several bloggers do this and I've been curious, but was never sure how to actually calculate it. 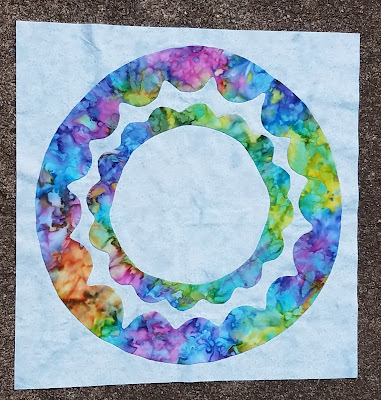 I asked Kate how she does it, and I'm using the method & math she was kind enough to explain to me in detail, with a few adjustments to make it fit how I sew. The biggest difference is that I'm only tracking when I complete a project. 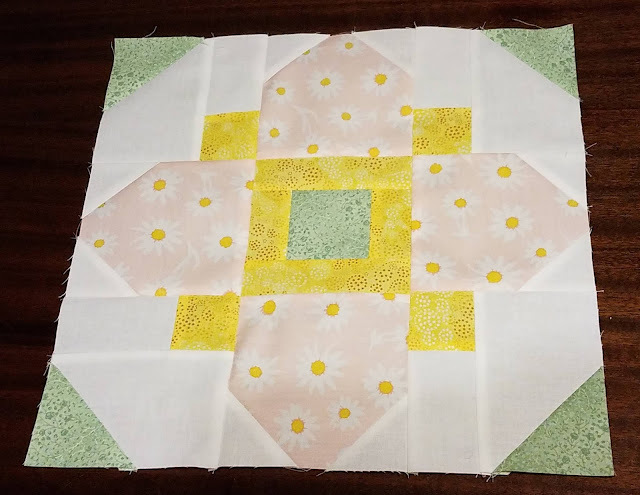 If it's a bee block or something that creating the unit is all I'm going to do, I'll add that to my monthly total, but if I'm the one finishing it, I won't track yardage until the project is done. I am more interested in overall numbers than a month by month comparison. This one is sheer curiosity for me. 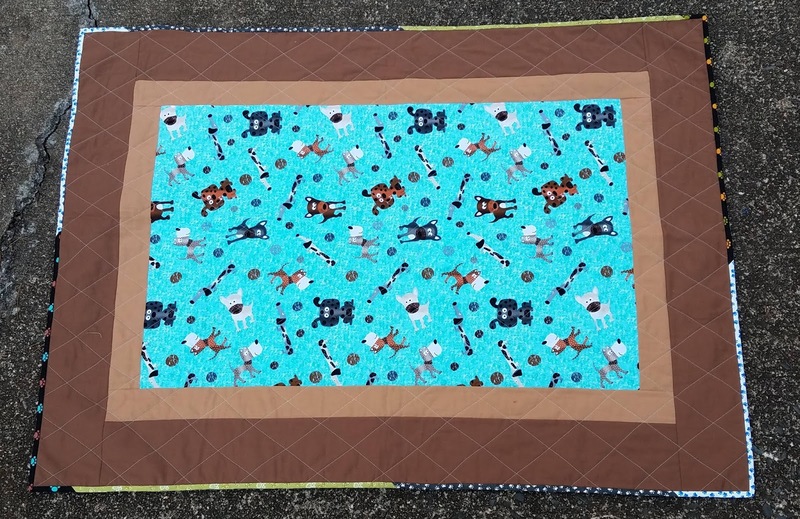 In January, I used 9.3yards. I'm also going to see if I can track yardage bought. I decided not to count anything given to me as a gift, including anything purchased with purchased with gift certificates. I did not make any purchases in January. I'm working on my PhD (Projects Half Done) with Quilting Gail. Her challenge is to finish at least half of your unfinished projects AND finish anything started in 2018. I have a list of 25 unfinished projects (I found another one since I posted my original list) and must finish at least 13 to earn my PhD. 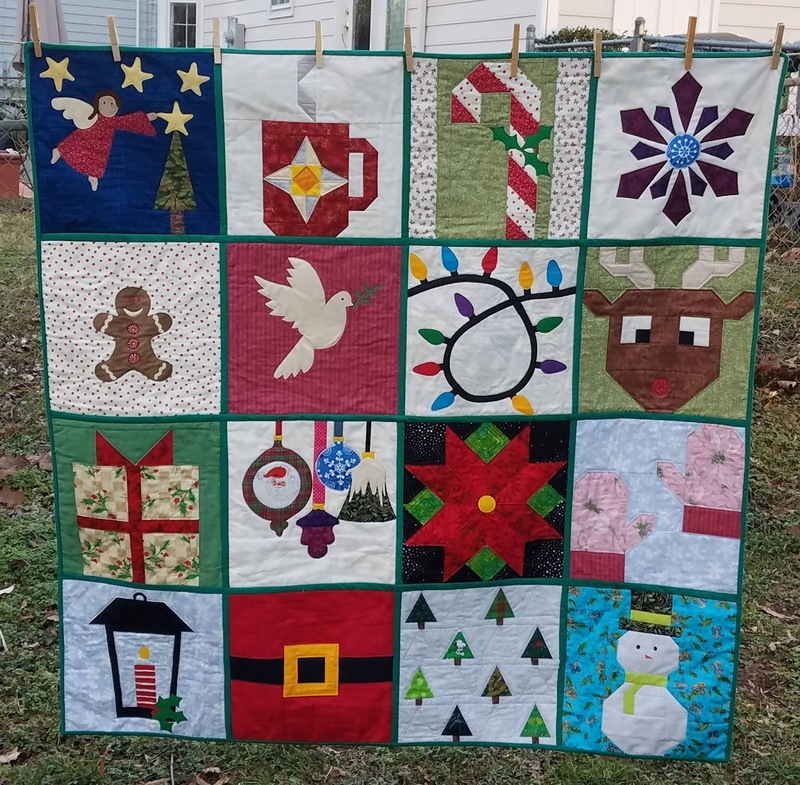 I completed 3 projects in January: I Wish You A Merry Quilt Along, a growth chart for friends, and a Project Linus donation quilt. 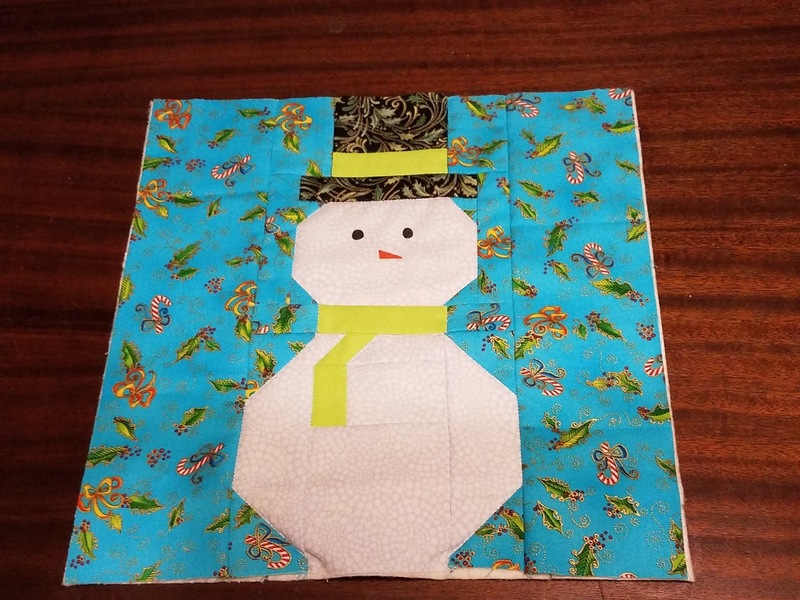 A little over a year ago, my friend Snow gave me a whole bunch of novelty fabrics from her stash. I think she decided novelty fabrics weren't her favorites and she knows that I love them. She had clearly made a dog quilt, as there was a sizeable stack of dog fabrics, many of them approximately half a fat quarter. 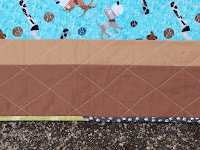 I spent a few weekend afternoons while my son watched the Paw Patrol DVDs his grandmother gave him for Christmas cutting the fabrics into usable sizes, specifically layer cake and jolly bar pieces. 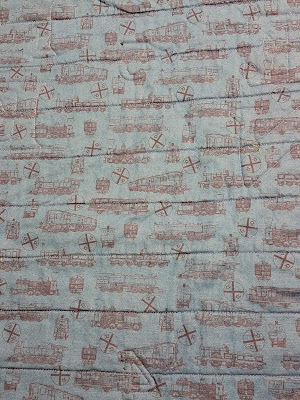 But there was significantly more than half a fat quarter of this lovely aqua dog print, so I didn't cut it up. 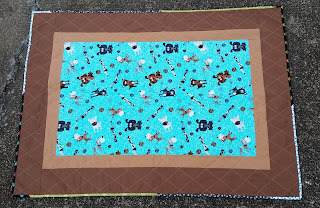 I figured I could add some borders and it would make a lovely Project Linus quilt. I decided simple was best. 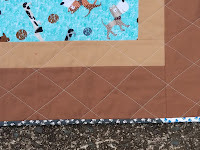 The inner border is Kona Biscuit and the outer border is Kona Sable. Several of the prints in the stack from Snow were dog paw prints. I thought they would make a great scrappy binding. 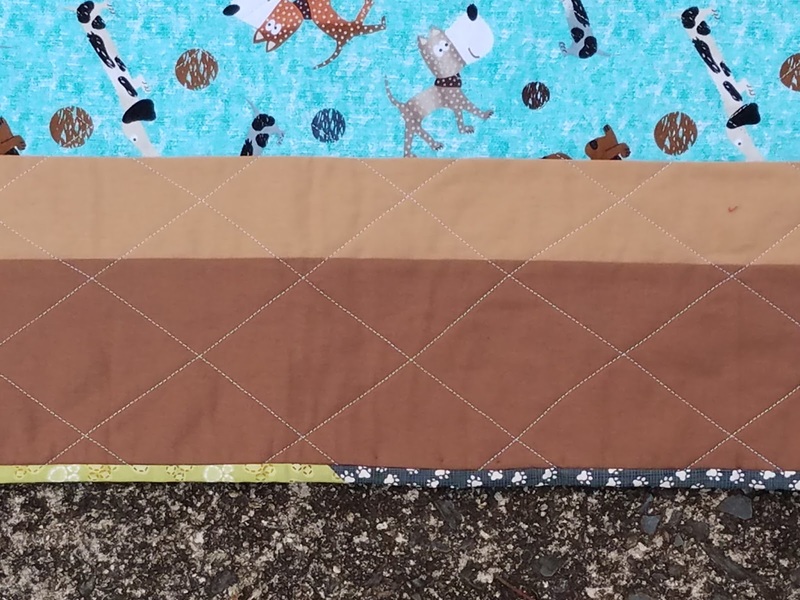 There are 4 different paw prints in the binding. 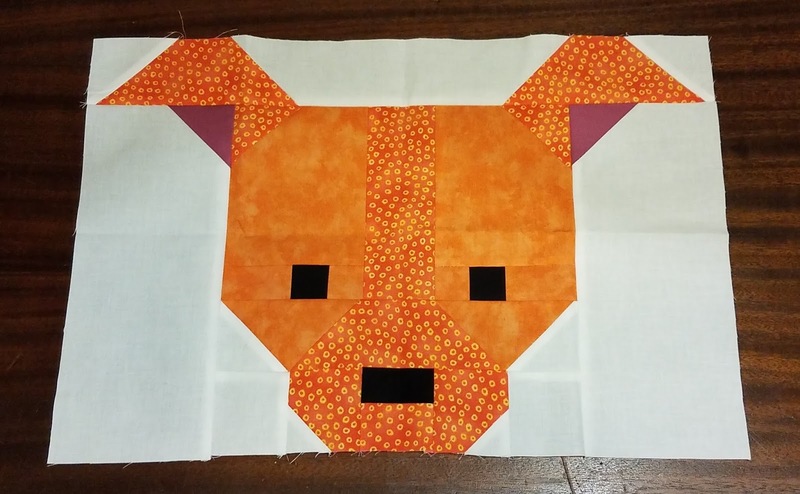 I did a diagonal grid for the quilting. This was project #16 on my list of Q1 goals for the globally-hosted Finish Along. 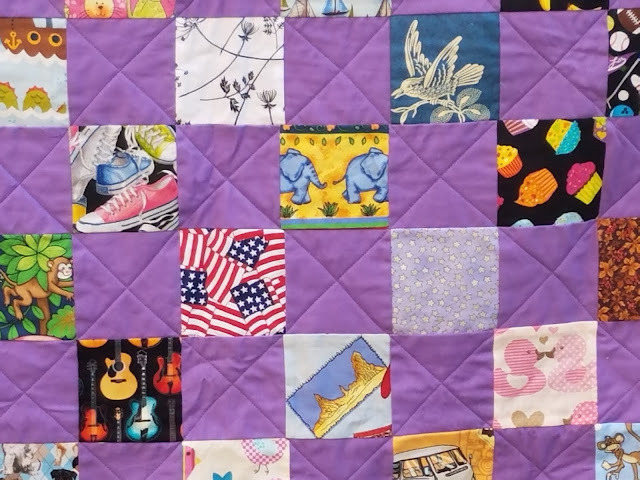 There are lots of phrases out there for partially finished projects. There's UFO (unfinished object), WIP (work in progress), PhD (projects half done), and many more. I tend to call all of mine UFOs, regardless of where in the process they are unless they are finished. In the spirit of completing those UFOs, I'm joining two motivational link-ups. 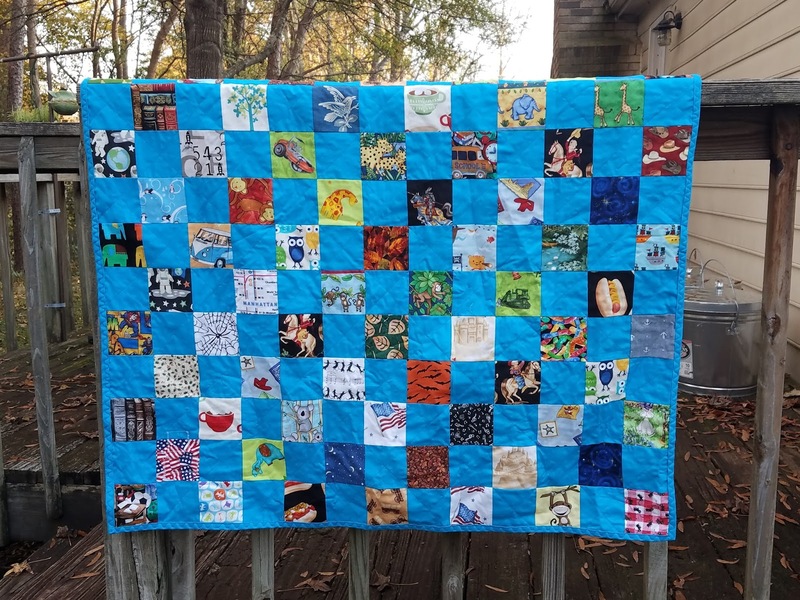 The first is the PhD in 2018 program with Gail @ Quilting Gail. Her program is that you must list all your PhDs and finish at least half in 2018. 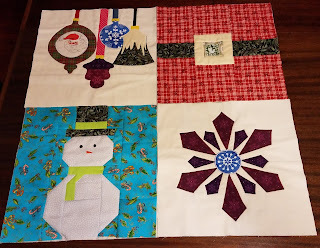 I have a list of 24 projects, so I must finish at least 12. In the interest of full disclosure, I am not including my 2 hand sewing projects on this list (one applique, one embroidery). I always have a hand sewing project prepped but I usually work on those only when traveling, so two or three times per year. My last hand sewing project took me over 2 years. The purpose of those is more about having something to work on and less about finishing, so I've kept them off the list. 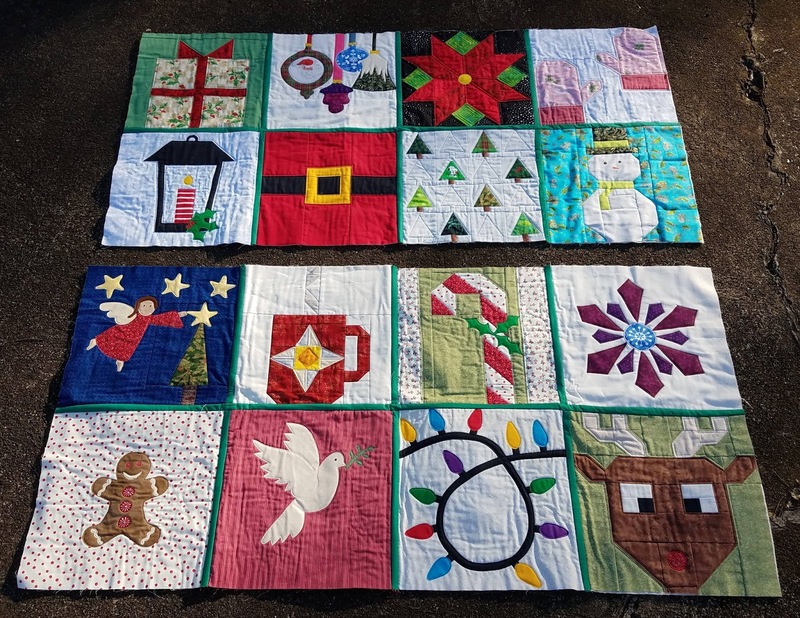 If, however, the hand work is completed in 2018 and it just needs to be quilted and bound, the other rules apply and I must fully complete it by 2018. 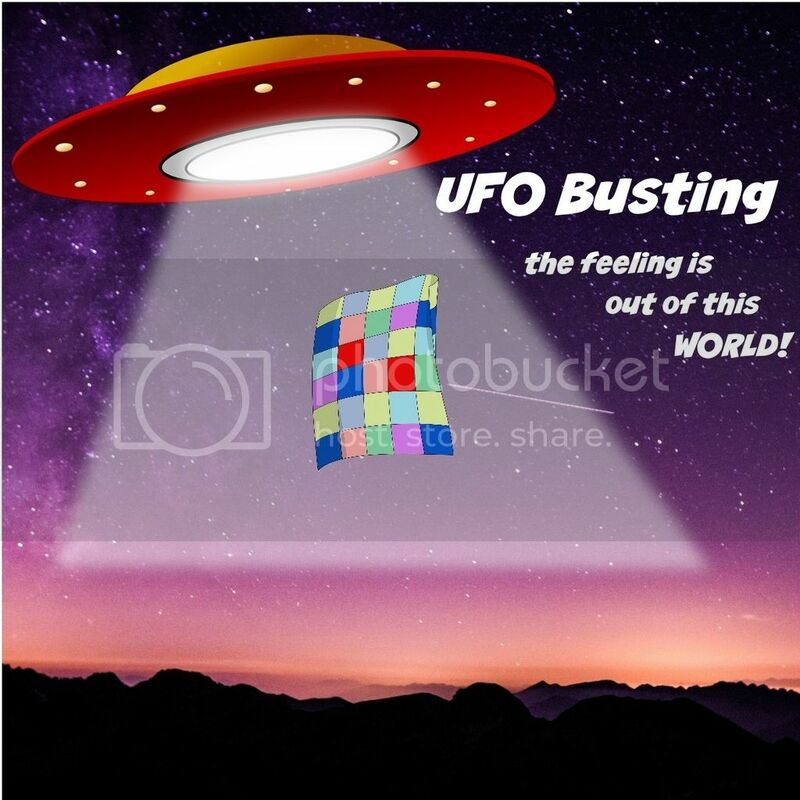 Tish @ Tish n Wonderland is doing a UFO busting motivational link up. My plan is to use that to give some focus to what I work on. 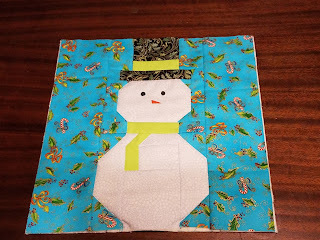 For January, my main goal is to finish We Wish You a Merry Quilt Along. I'm almost done! It's also likely that I can finish the growth chart for friends. This is much farther along than the picture suggests. 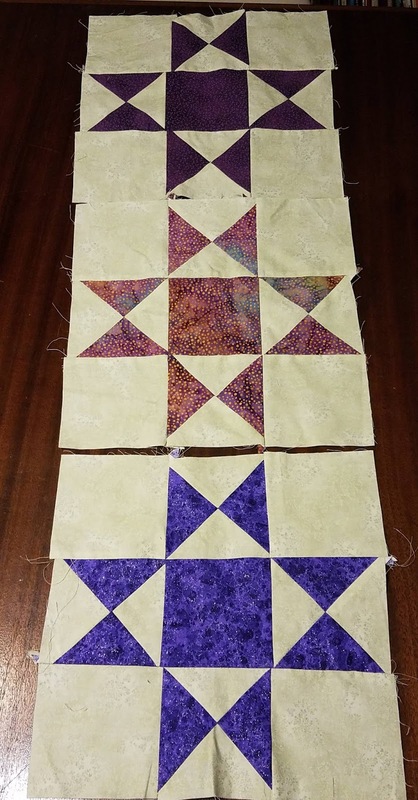 When I'm not working on those, I'll be piecing Ohio Star blocks. 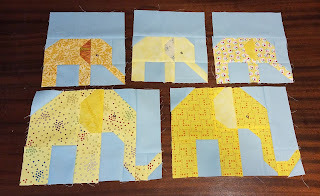 These are for Laura's quilt. I'll be seeing her some time in 2018, likely summer, and I plan to give her this quilt then which means I need to really get cracking! Here's hoping I'll earn my PhD in 2018! And say good bye to those UFOs! Technically, this wasn't my last finish of 2017; the dinosaur sweatshirts were. But this quit hasn't been blogged yet and I'm trying to catch up. 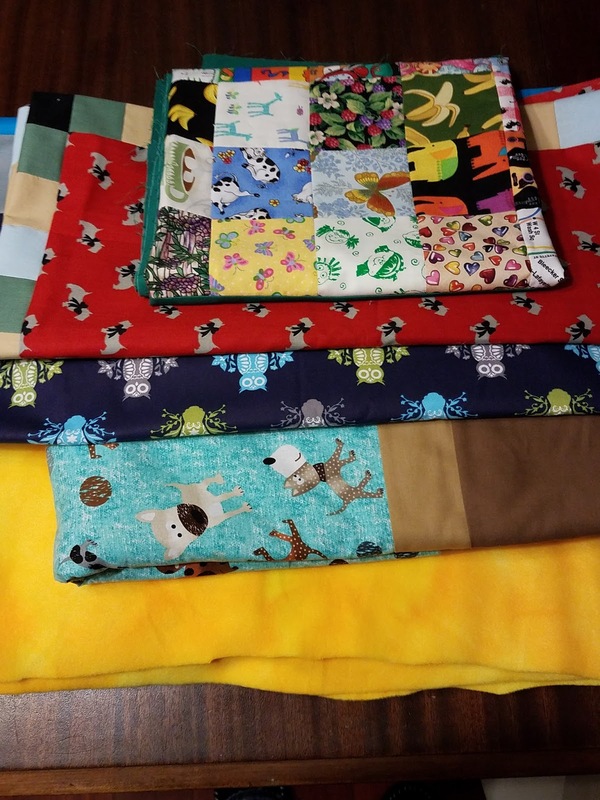 Someone donated this colorful (and a little bizarre) Noah's Arc fabric to my local Project Linus chapter. 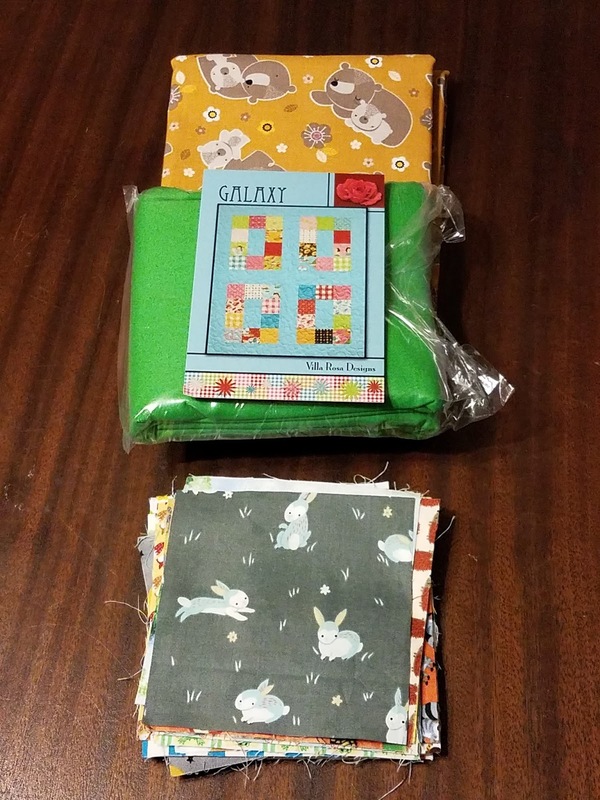 I tend to get the novelty fabrics because the group all know those are my favorites. 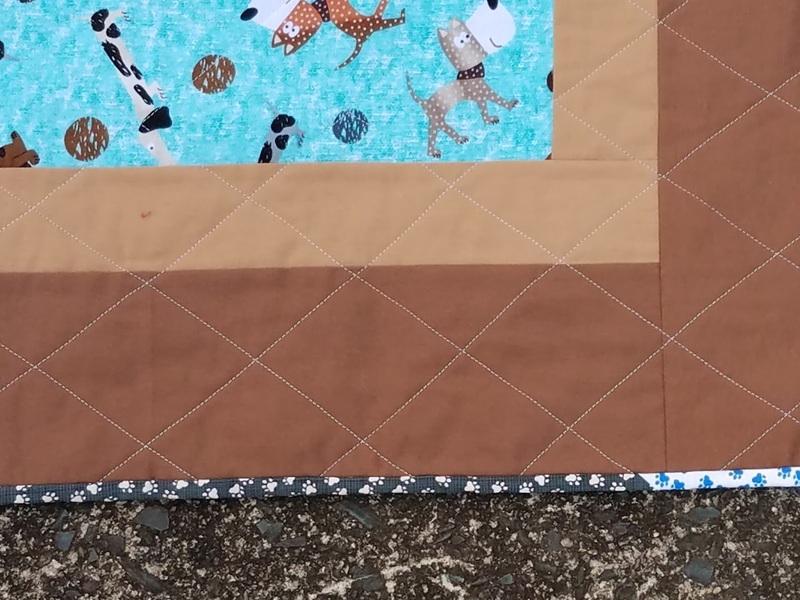 It didn't make sense to cut it up so I decided to frame it as a large log cabin block. The solids are Kona Lemon, Cabbage, Lake, & Malibu. 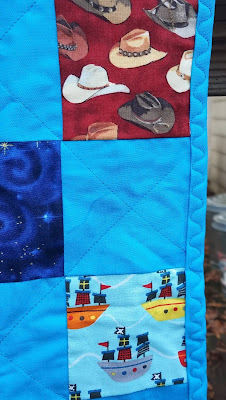 I used leftover binding in a variety of shades of gray. 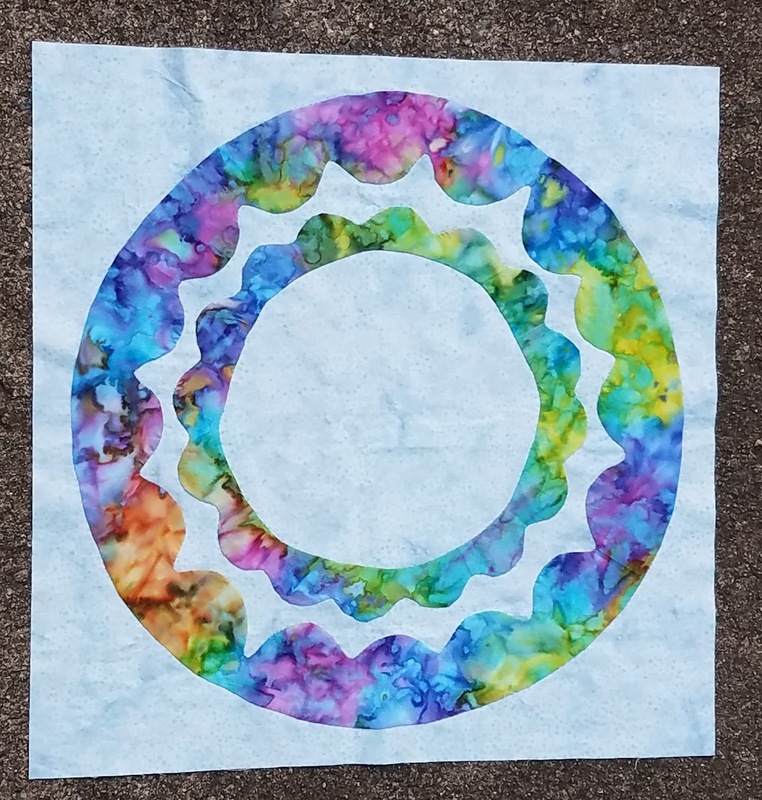 I quilted it with a big spiral coming out of the center. I call it "Noah Didn't Build a Log Cabin." This was project #14 on my list of Q4 goals for the globally hosted finish along. 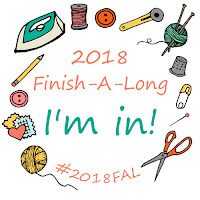 I have a few 2017 finishes that didn't get blogged last year. 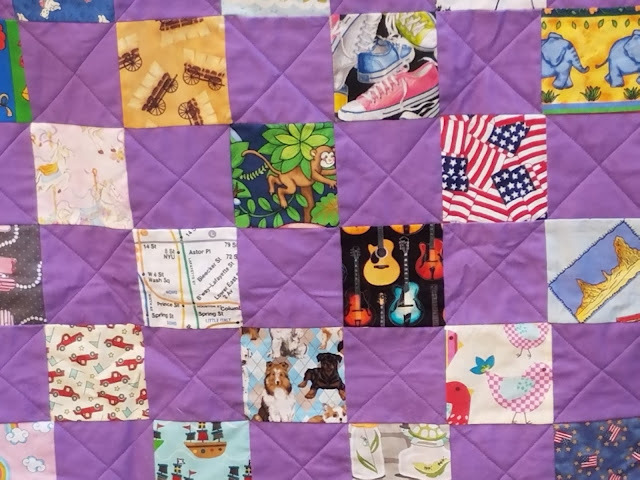 Two of them are I Spy scrap quilts. 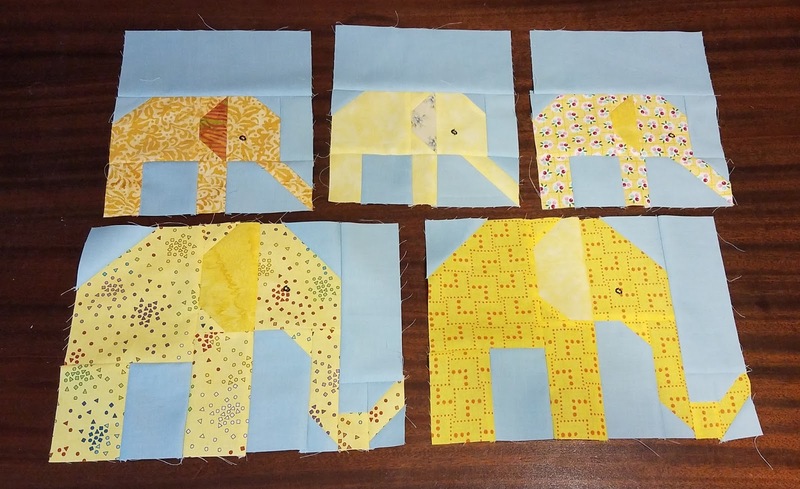 I cut my I Spy scraps into specific sizes and use them up in scrap quilts. These are frequently my leader and ender projects. 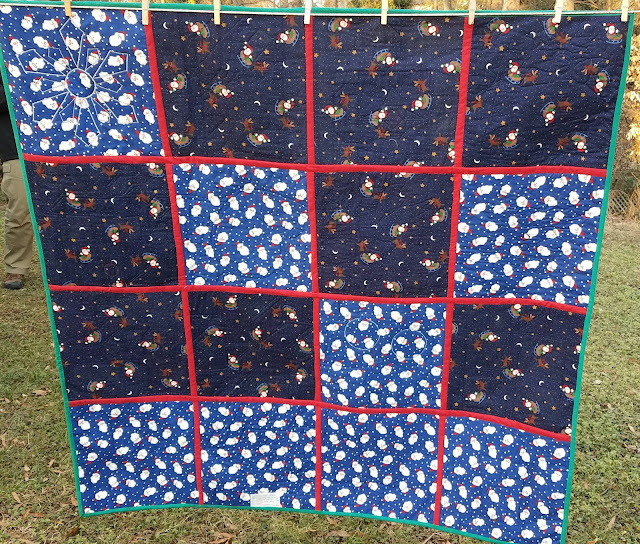 My pile of 3 1/2" squares was getting quite large so it was time to use them up. 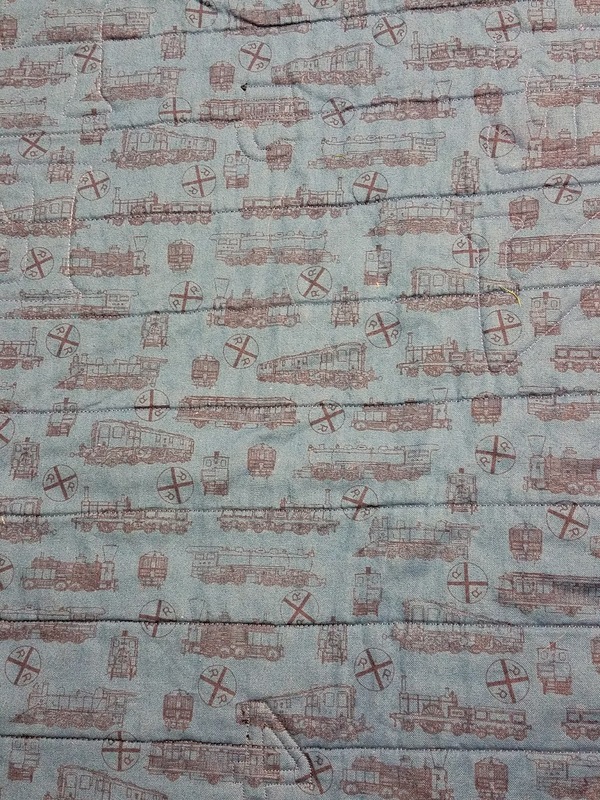 The first uses Kona Lagoon as the alternating fabric. 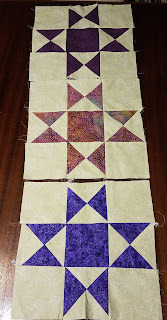 The scraps were just pulled out of the pile randomly, though I intentionally did not use pink or purple in this quilt. Frankly, I think "boy colors" and "girl colors" are crazy and I could rant about it, but this is going to Project Linus and I've been told by our coordinator that some places won't give boys quilts with any "girly" colors in them and we tend to be short boy-appropriate quilts. 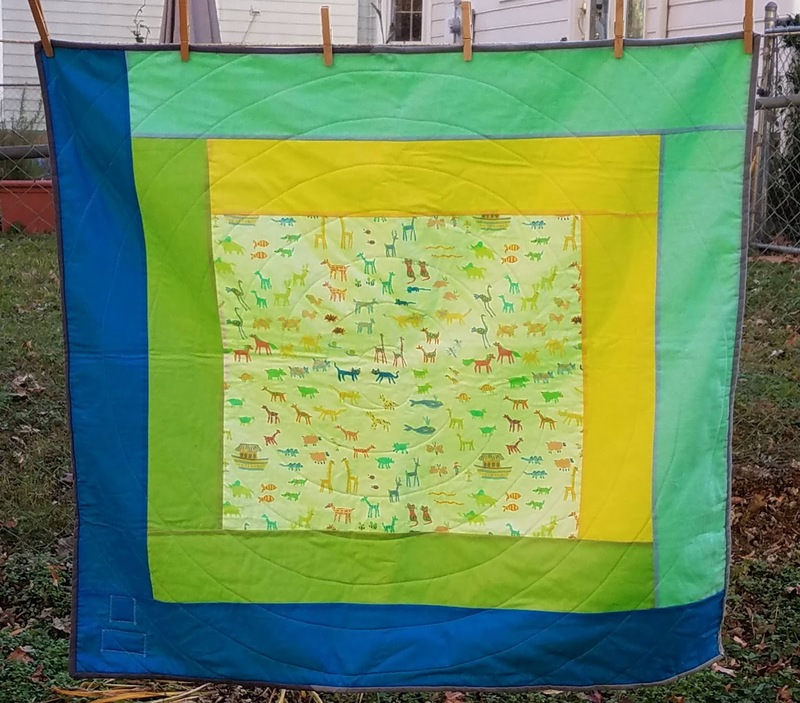 So I don't rant and I try to make quilts that kids will like, and a kid can't like a quilt they aren't given. 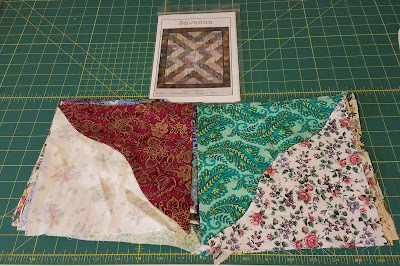 I generally hand-sew my binding but not when a quilt is backed with minky. 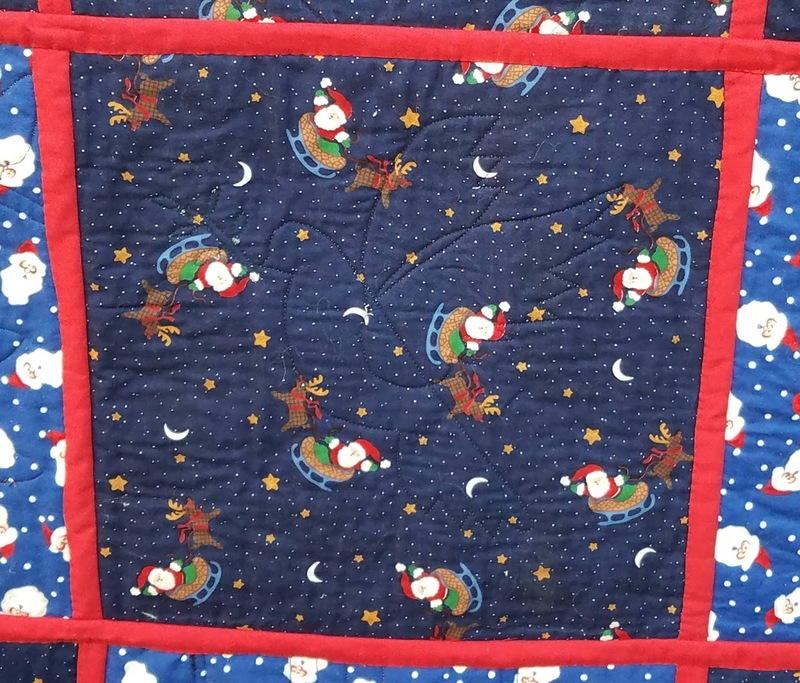 I used the wave stitch on the binding and I really like how it came out. The second quilt has Kona Morning Glory as the alternating fabric. This quilt did get pink and purple I Spy scraps, as well as anything else that was in the pile. 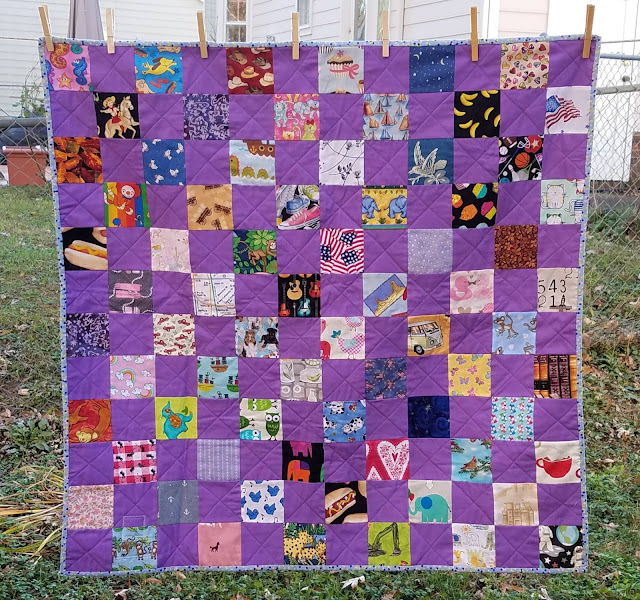 The Morning Glory was left over from a quilt for my cousin's daughter and I just had enough for the squares, so the binding is a fun dot print that I had in my stash. 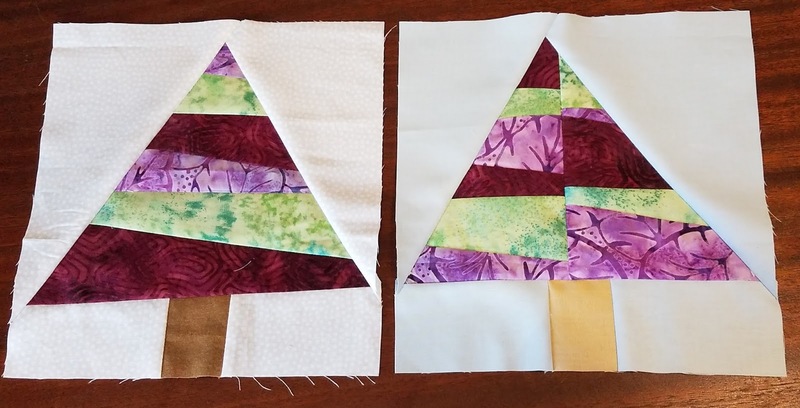 You'd think this would mean I'm out of 3 1/2" scraps, but you would be wrong! I have another top using 3 1/2" squares already completed and could easily make at least one more. I swear that scraps grow on their own overnight! 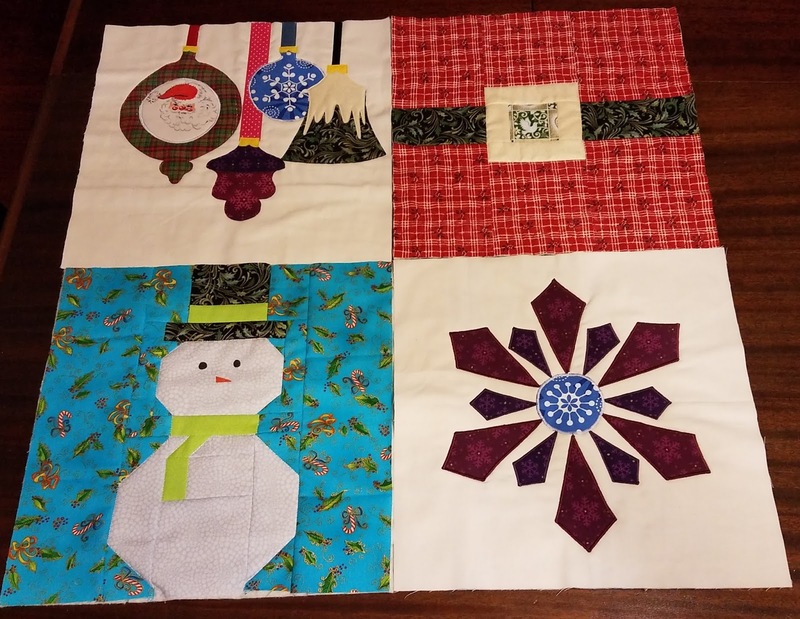 These were projects #16 & #17 on my list of Q4 goals for the globally hosted finish along.